The updated 5.1 version of Opera Mini launched on the Android Market overnight, promising to focus on speed and usability—bringing more of a "PC-like" browsing experience to Android. If that's what you really want. 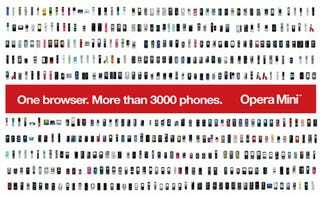 Opera spreads the love to Android mobile phone users. Opera Mini 5.1 is now available for phones built on the Android platform, offering better browsing performance and improved user experience. With over 61 million users worldwide, Opera Mini is the world's most popular browser for mobile phones, allowing much faster browsing speeds, while keeping the costs to a minimum. Browse at lightning speed today by downloading the free Opera Mini browser from the Android Market or at m.opera.com. Opera Mini is a favorite not just on feature phones, but also on smartphones, scoring an impressive 1 million downloads on the iPhone during the first 24 hours of availability. Opera Mini is highly optimized for almost any handset, delivering the best Internet experience on more than 3000 mobile phone models. Opera Mini raises the game on Android phones. Since its Opera Mini 5 beta release, Opera Mini can now be set as the default browser for more convenient Internet access. Opera Mini 5.1 also offers improved page layout on high-end Android handsets with large screens. "Opera Mini 5.1 for the Android platform is the next step in bringing the world's most popular mobile web browser to all major platforms, offering improved performance and great web experience to almost any handset," says Lars Boilesen, CEO, Opera Software. "Opera Mini is used by over 61 million people on more than 3000 handset models and with today's release Opera continues its mission to provide the best web experience on any device and on any platform." Opera Mini brings the Web to almost any handset by compressing data by up to 90 percent before sending content to the phone. This results in significantly improved page loading speed and reduced data costs for the user. For example, with webpages such as BBC.com, a normal mobile web browser will display a BBC News page roughly 1 time, as compared to 9 times with Opera Mini for the same cost. In addition to providing speed and cost savings, Opera Mini 5.1 comes with useful features, such as tabbed browsing, password manager, bookmarks and Speed Dial, built into the browser to deliver easy web access while on-the-go. With Opera Mini optimized for Android phones, more people are able to get a PC-like browsing experience on their handsets. Download Opera Mini directly to your Android phone for free from the Android Market, or at m.opera.com. For more information, visit http://www.opera.com/mobile/.